New single and double security rated doorsets to SR4 for structural openings of up to 3.075 metres in height and a fire rated high security vision panel for doors to SR4 are just two of the recent additions to the comprehensive range of industrial steel doors and louvre security systems from Ashford, Kent based Sunray, a leading UK manufacturer and installer. 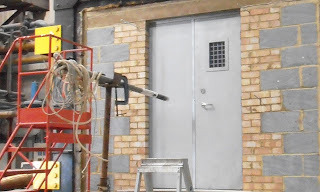 Traditionally, a transom frame and overpanel system has been used for doorsets with high openings but this had the disadvantages of being less cost effective, aesthetically unpleasant and not security rated. Sunray therefore developed and has just launched a range of single and double doorsets to suit a structural opening of up to 3.075 metres high to the Loss Prevention Certification Board (LPCB) security ratings of SR3 and SR4 to the latest issue 7 of LPS 1175. Similarly, recent developments and rigorous certification testing means that Sunray can now offer a high security vision panel at SR4 with both one and two hour fire rating, in compliance with BS EN 1634. This is additional to its already popular ‘ExcluDoor 4 MK.2’ doorset range to LPS 1175 issue 7. Pictured is the ExcluDoor 4 FR double doorset from Sunray with an ExcluGlass panel prior to fire testing to ensure it meets the BS EN 1634 standard for fire resistance and smoke control tests for doors. For more information please visit www.sunraydoors.co.uk or call 01233 639039.